>So another day has come to an end. Indeed, one year can be a long time especially when you go through some lull periods in life. One year is all it takes for two people to go in vastly different directions!!! Two lives could not have been more coincidental than what has been the case with myself and one of my best friends, Hrisheekesh Sabnis. We were in the same school, St. Francis D’Assisi High School. I came to know him when I was in Std VII as we used to board the same bus (bus no. 207) to go home. Those were the days of heated competition where comparision between the toppers of each division used to fly thick and fast. But it wasn’t until Std X that I came to know him better since only then the teachers stood up to take notice of the possible candidates who could make it to the merit list!!! I had shifted my division from H to C and now the competition with Hrishi was even more direct – he was till then the topper in div C!!! If I remember correctly, I had stood first in the class in our first unit test where Hrishi was second; we swapped our positions for the terminal exam and I managed to stood second in the school in our prelims in our school in which Shreyans stood first. Hrishi managed to come 2nd in the school in the Std X board exams and I stood 7th. At that time, I never thought we would land up in the same college and same classes again!! After two years of real hard work, I still fondly remember the happiness on our faces on the morning of June 2nd, 2002 when we both cleared our JEE exams and still we weren’t much far away from each other – I was at rank 678 while Hrishi got 850. Again I didn’t know what fate has decided for both of us! !Call it a quirk of fate and where Hrishi had almost applied for aerospace engg at IIT Bombay while I had applied for Mechanical engg at IIT Madras, which both of us would have got for sure, we still found ourselves joining B.Tech. Chemical Engg at IIT Bombay thanks to a certain chap called Durgesh Mangeshkar!!!!! 4 years at IIT Bombay were soon to be a roller-coaster ride of our own – in all respects, be it completing assignments, mugging for exams, having late-night rounds of the canteen!!! The first two years, Hrishi sailed clear of me and especially in the 4th semester where he cracked 9.42 on 10 with ease, I guess some complacency got hold of him..By now more popularly now as Mota, Hrishi was “enjoying” chem engg. like nothing before. He had a fantastic trip to Europe in the summer of 2005 for his internship while I spent my hours slogging in a plant in Sriperumbudur to earn what I can proudly call my first salary – Rs. 8000 per month!!! The last two years, we spent a considerable amount of time studying for our common courses esp on the nights before our exams!!! By the time, placements arrived, we were almost in the same boat of academically categorized students!!! The “studs” in our college got placed soon and PhD was looking like a distant oasis for our dear Hrishi. 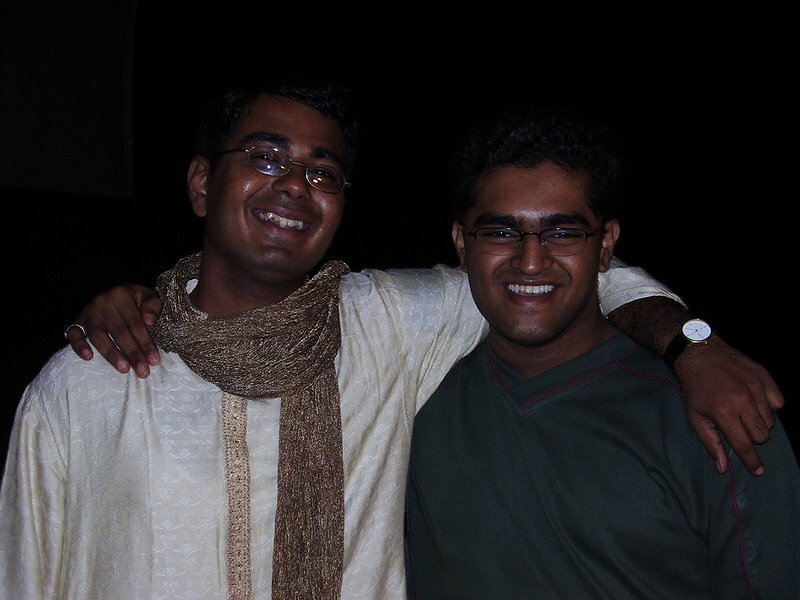 Then came yet another big moment in our lives – in the wee hours of 16th June, 2006 when Hrishi and Mohit came running to my room where I had already fallen asleep to announce that both myself and Hrishi had got into Modelytics!!! I simply couldn’t believe how two people can study in the same school, same junior college, same classes, same branch of engineering with nearly similar kind of academic record and now we cracked the first job of our lives in the same company!!!!! Well, life could not be more coincidental after all and soon I found myself joining an engg company in Abu Dhabi while Hrishi flew down to Bangalore in the June of 2006. Our experiences probably became much different at this time – Hrishi prepared for CAT while I spent my time visiting new places!!! It cannot be more poignant that Hrishi joined IIM-A on June 21st, the same day I completed one year in my office!!! Sometimes, I wonder what role destiny plays in all our lives, how so many things conspire to take us to an unimaginable position in life with or without our knowledge!! When we look back, we begin to feel,”So near yet so far” not truly in terms of opportunities or success but in terms of parallels in life itself!!! All the best, Hrishi. You are on your way to achieving a lot of success. The best part about you is that I can call you, meet you and talk to you in the way I want – so what if you become the CEO of some of the biggest companies of this world :)!! This blog is specifically dedicated to you without whom I could not have managed to experience so many wonderful moments in life!! >I could not find a better title to put but now-a-days surprisingly I have got hooked on to watching this TV serial on Star Plus. Am posting my favourite episode here – especially with the song “Mitwa” from KANK in the background. I really wondered if people could be crazy enough to post videos on youtube. This is just for the people who think they are crazy enough!!!! Somewhere the innocent way in which the love story is brought out makes the serial worth watching. I have a craze for these innocent love stories which very few movies or serials ever portray. Shubangi Atre dazzles in her role as Kasturi not so much for her acting skills as much for that innocent smile and it’s really hard to imagine she’s actually a mother of an 18 month old daughter in real life!!! Hope you enjoy watching it.